US Army Captain Dale Morton is a magician soldier—a "craftsman." After a black-ops mission gone wrong, Dale is cursed by a Persian sorcerer and haunted by his good and evil ancestors. Major Michael Endicott, a Puritan craftsman, finds gruesome evidence that the evil Mortons, formerly led by the twins Roderick and Madeline, have returned, and that Dale might be one of them. The Internet Review of Science Fiction has hailed TOM DOYLE's writing as "beautiful & brilliant." Locus Magazine has called his stories "fascinating," "transgressive," "witty," "moving," and "intelligent and creepy." A graduate of the Clarion Writing Workshop, Doyle has won the WSFA Small Press Award and third prize in the Writers of the Future contest. 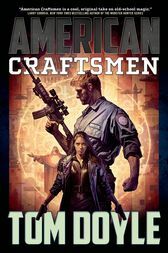 He is the author of American Craftsmen and The Left-Hand Way.